One of our trumpet players, ahem, Nick, has illusions of grandeur. He believes that on June 5th at Verizon Amphitheatre, The Taj Motel Trio (that’s us) should open for Poison and Cheap Trick. Does it seem odd that a ska-punk band from Georgia wants to open for two of the greatest rock bands of all time? Could it be a fantastic show? He’s so obsessed, he’s even learning the guitar lick from Unskinny Bop on trumpet. His first real concert, not counting the time he saw the Teenage Mutant Ninja Turtles on their Coming Out of Their Shells tour, was Poison…Flesh and Blood tour…1991…with Slaughter and the Bullet Boys at Lakewood Amphitheatre in Atlanta. Poison and Cheap Trick are rock legends and who better to help us bring more southern ska-punk metal to the masses. Ben started playing guitar after watching CC Deville perform on the American Music Awards. He wants to go to the show anyway. He says we’ve opened for Bon Jovi and it is an embarrassment that we haven’t opened for Poison or Cheap Trick yet. 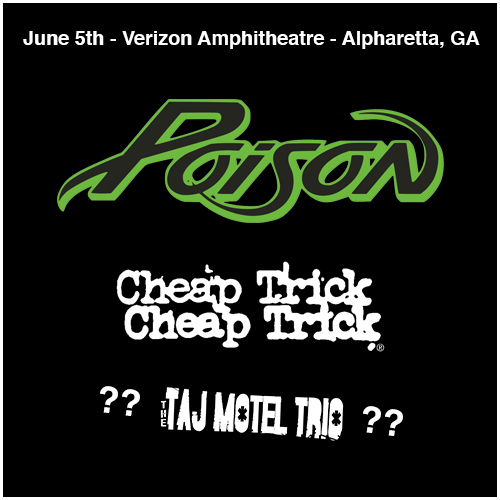 Post on Facebook, Instagram, and Twitter @ the band Poison or Cheap Trick or the venue (Verizon Amphitheatre) asking them to let Taj open the show using the hashtag #SurrenderToTaj. For the person who does it the most between now and April 15th…we’ll ship you a Taj t-shirt of your choice (if it’s in stock) and a one of a kind copy of our “4 Songs, 7 Inches” EP. The odds that this will work are slim. But, I guess you don’t know if you don’t try.